Discussion in 'Civ3 - Completed Modpacks' started by Eclipse, May 8, 2002. Ok, after countless hours of work, here it is! The Governments are "roughed in" and will absolutely change so don't get too hung up on there current state of disrepair. The tech tree, wonders, resources, and quite likely improvement will be changing also prior to final release. Again, the main focus of the beta is to test unit animations, other game graphics, and to get some constructive feedback from the playtesters. I've yet to complete the credits page but until I do, I'd like to give a big thanks to all those on this board who have created some of the fantastic unit animations I've included! Good job all! Feel free to email me directly at eclipse1024@hotmail.com if you have any input you'd like to remain anonymous. Hope it is not just me, but, in two games playing this mod now I have received the error "Eras_Splash_Second Age...... " this game will exit immediately. A little frustrating as in my last game I was in the middle of a major takeover. I restarted to the last auto, same thing, and then 2 auto's back, same thing. Has this been reported before? The modpack is now available in one big file (39.06 MB)! There are a number of options available: break it down into several smaller files, Yahoo (and others) allow a briefcase to store up to 30 MB free, individual file limited to 5 MB. BTW, I am looking forward to playing it once you do have it available. Nice to see you finish so early, I did't think you would get it up so soon, Good Job. I look forward to playing it. Running file 13 just brings up "run program with" screen. I used "save file as" on the thirteenth, by the way. So, what do I have to do to get it working? What files do I need to back up before I run this? Okay, I backed up the Civ III Art, Text folders and the bic file, per the installation wizard. I was downloading your mod, and when I tried to download file 13 it just took me to a page with commands. Is this some sort of instruction, and if so what am I supposed to do? Here is how I was able to download file 13, I had the same problem you did when I first tried to d/l it. You want to do a "save as" instead of an open new window. If you have IE save target as and save file 13 as a .bat file then take the .net extension of 1 to 12 and run the .bat file. Clicking on the film 13 will just show you the .bat code. When you run the bat file 1 to 12 will come to together to form a setup program. Sorry guys. I didn't think the download process would be such a pain. It looks like you were all able to answer your questions however. Thanks for sticking in there! Has anyone actually been able to play it yet? I've only gotten a couple of emails from folks so far and I want to make sure the installer is working for everyone at the very least. "I'm just a ordinary person who finds himself in extraordinary situations." Eclipse, I am playing a standard map, with 6 other civs, the Dwarves against the Easterlings, Dark Elves, Haradrim, Dorwinrim, and the other non good races. So far, so good, it is about mid 1000's BC, and the only problem I have had is intermittent screen blackness, usually for only a half second or so. This was not happening before I d/l'ed the game. Everything else is going great. Ok, so my first game was perhaps a fluke.....I just was playing a game as the Woses and when I tried to change governments from despotism to empire (just to see how that worked 'cause I don't actually know the differences yet) the game crashed. So I started a new game as the hobbits and I built the first city and tried to build "halfling spearmen" and the game crashed out to windows again. So I tried the halfling experiment again, and it crashed a second time. Just some more constructive criticism, we'll get there. Good job so far. 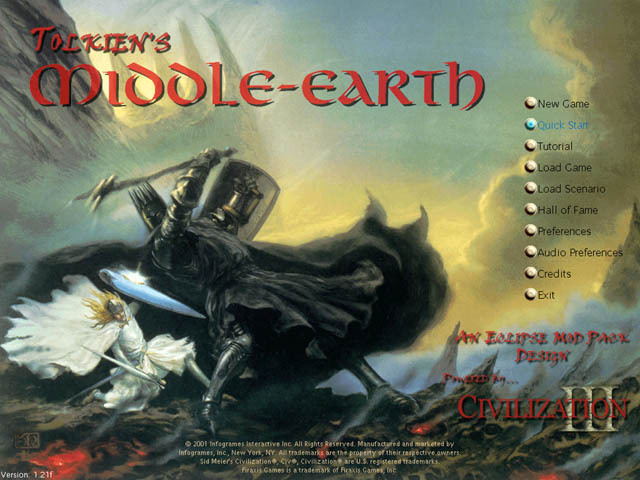 I tried running Civ3 after installing the Middle Earth Mod and it won't let me start a new game. I clicked on New Game but nothing happens besides the clicking sound. Does anyone else have this problem? hey Eclipse, I was going to delete your modpack files from the server because it looked like usage abuse to me. I thought someone is using the file server for personal stuff.